One thing R said to me, on leaving, was that that distance might enable me to gain new perspective on London, Britain, Europe. We'll see about that. But a thought does occur on London, with respect to views and skylines. My new city, Sydney, has what you might call A Proper Skyline. It's stunning, and visible from numerous angles, distances; from the water or from the green, hilly surrounds. When the sun sets over the city, seen from the bus curling its way back to Vaucluse, from Bondi up the Old South Head Road, or through Double Bay and Rose Bay on the New South Head Road, it's truly beautiful. It's barely worth taking a picture of it, as you can't really capture its splendour, and there are probably several hundred thousand out there anyway. (Difficult to resist though). It's not even the only view, as Sydney is blessed with many of them, in almost all directions. The obvious views become augmented by the sudden, surprising glimpses, a slice of the Bridge, a sliver of harbour. How great that citizens can quietly enjoy these views every day. Like many of Sydney's natural advantages - sitting on Bronte beach in the winter sun, for example - it's a very cheap form of entertainment in a city not renowned for a low cost of living, by Australian standards anyway. Even if I end up like David Wenham in 'Three Dollars', I'll still have The Views. We'll see how that feeling endures, as time breeds familiarity, which in turn breeds not contempt, but somehow engenders a blasé ocular oversight, leading to taking such things for granted. I suppose you must just stop pointing out that "It's a glorious day" at some point too. 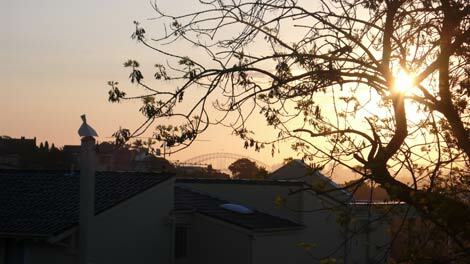 It's interesting to observe how Sydneysiders react to the ubiquitous jaw-dropping views. Needless to say, their jaws don't drop every time they see one. Cranial osteopathy would be Sydney's most lucrative profession if they did. Instead, you might see an old feller steal an odd glance across the sparkling deep blue water, from the North Shore Line train over the Harbour Bridge, before his eyes settle back into the middle distance ahead. I'd seen this effect before, in Bilbao. I remember being up early one morning, stepping out for a breath of fresh air after feeling the combined effects of travel and Basque wine, and wandered over to this sculpture of a building, the Guggenheim, gleaming gold in the pale light. I stood in front of it, agog, for a good 20 minutes. Meanwhile, around me, Bilbao was going to work, or out jogging, or heading for a coffee, but rarely looking at the Guggenheim. I saw several jog right past this enormous, glistening beast without even looking across once. Given its opulent, over-the-top form it was as if the building was daring them not to look, unfurling itself before them, the sun's rays creeping across the undulating tiled skin, as if a Frill Necked Lizard living up to its name. And Bilbao's citizens just jogged right past, running along the riverside that broadsides the gallery, not even a quick glance of recognition. Perhaps even the most riveting views fade with time and repetition. London has few such obvious views. It's not a city of spectacle, with little beauty in its natural setting - like Tokyo or Paris, and quite unlike Sydney, or Seattle, or Rio, or Zürich - and it's a city that makes the resident and visitor work hard to unpick its secret delights. Sure, you have the odd spot, such as views back from north London (as noted before). But the view of the city is one of a largely featureless, low-rise sprawl, with only the city and Docklands providing some brief vertical interest, fairly incoherently. 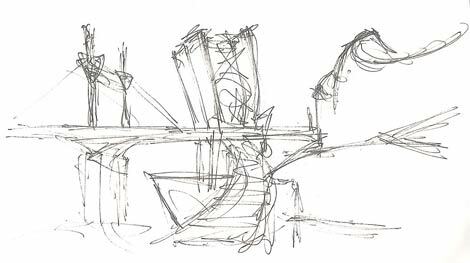 It doesn't have the classical urban form of a slowly building crescendo of buildings downtown, as with Sydney, where the upwards curve of the Harbour Bridge draws a trajectory up to a series of 'scrapers culminating in Centre Point. London is more dissonant, polyphonic, dispersed, difficult to get a grip on. The central curve of the Thames can present a good aspect. But it's not a city with the views at every turn you can get in Sydney. The skyline isn't something you can draw, and although a loose assemblage of icons will do in terms of representing a city - for example in this set - the skyline isn't something you think about in London. 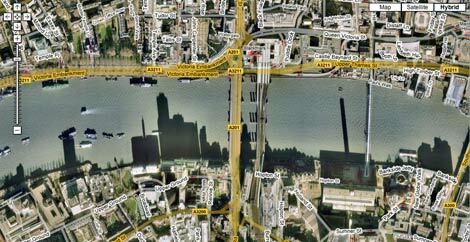 Only here, when I chanced across this view on Google Earth - which might be gone now, due to the regularly updated satellite imagery - did I think about a skyline along the south bank of the Thames, for instance. I hadn't noticed it had a skyline, until I saw it here, stretched out in shadows. It struck me that this is an entirely representative London view - unlikely, difficult to observe or describe, a little ragged and dirty, in brown and grey, and probably gone tomorrow. But perhaps all the more interesting, as a result. 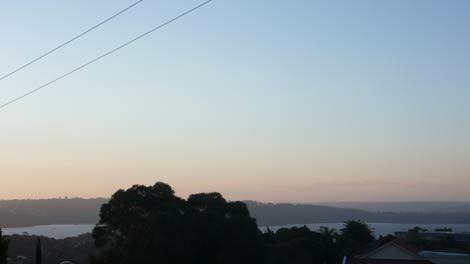 The odd sniffy Melbournian might say that all Sydney has is The View. Which is a little harsh. Just how harsh remains to be seen, but for the new immigrant to this city - as I am - the views are startling, wonderful and an everyday pleasure. I may get used to the weather, even being English, but I'll try to resist becoming blasé about The Views.